Allow Zimmermann to take you on a journey. Flowing silhouettes, ethereal prints and delicate lace characterise their ready-to-wear collection. 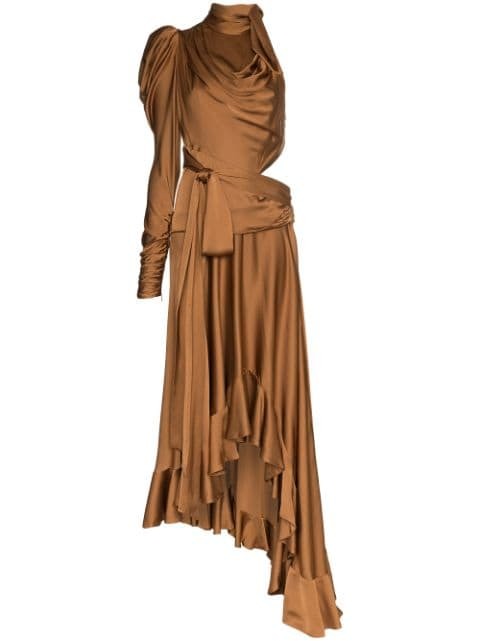 This bronze satin draped dress from Zimmermann features an open back, an asymmetric neckline with a ruffle trimming, a high neckline with a side tie fastening, one long sleeve with a gathered shoulder and a daring cut-out side detail.